Aren’t those robots cute? I did a trade with Ariel (it’s her own design) for it…and I’m pretty positive got the better end of the deal. After a quick sew and letting Ben do the stuffing…he ended up with a cute pillow he can play with. So now his room has a robot pillow, pirate sheets, elephant curtains, a superman poster, animal alphabet flashcards and a batman cave in it. His poor room has an identity crisis. He loves his pillow. I’m not sure the pillow loves him back though….we’ll give it a week and see if it still has the stuffing. And ‘cause you asked…I called them sprocket pillows because my husband was assembling a bike while I was assembling these pillows. Bike sprockets…round pillows…get it? Yeah me neither….just smile and nod. SO cute! I wish I had a robot pillow in my room! That would be totally appropriate for a grown woman, right? . . .
That is a gorgeous pillow… and I totally get why you call it a sprocket pillow! What a cool mom you are. I think my kids would like those too. Thanks for sharing the kid version! Oh I love these too. That robot fabric is great! Totally love your sprocket pillows and thought the name was quite fitting!! And I love that your little boy's room is a mix of all the things he loves. I have got my fabric. Got my button cover kit. Got my templates printed out, and traced onto cardstock. I am ready to SPROCKET!!! How in the world did I miss this tutorial??? What a wonderful pillow!! I have made my daughter a quilt for each year that she has gone to college (2) and I think she will need a matching Sprocket pillow for this Fall's quilt! The last picture of Ben squeezing the daylights out of his pillow is heart-warming. I do love this pillow! My grandkids will LOVE to have sprocket pillows. And the name is too cool– and fun to say! How fun! I'm lovin the bright colors and the whole "sproket" concept! I LOVE this pillow — and am so glad that you shared the tutorial. Ooh, I'm loving the kid version! My toddler would love one. love the fabric combo!!! !… perfect for a boy and i love the robot fabric! I made one and gave it to my daughter. The one you made for your son is ADORABLE!! I have plans to make more. 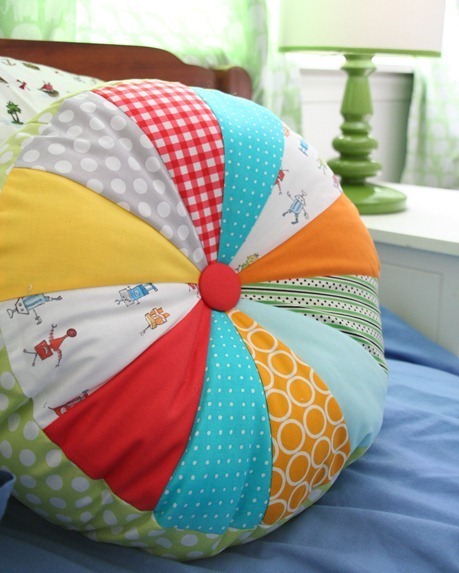 Your sons big squishy sprocket pillow looks fantastic in the room with an identity crisis! How cute are these! LOVE Them… Your blog is just amazing, we love it! my sister and I would love if you came and checked out our new blog and became our newest follower! we'd also love any tips you have on making such a fabulous blog! Never thought to make the kids their own sprocket pillow they love mine to bits I just can't explain that mine is purely for decoration. (http://veryspecialcreations.blogspot.com/)looks like I will be making a few more of these…love your version of the kids pillow. Love it! I also think your sons room is VERY cute the way it is! I like the mismatch, and the great part is that if he goes out of one thing, you don't have to re decorate his room!! I have really wanted to make this pillow and so I will have to ask my boys if they want one and if they do…make it for them. Although they are pretty much into their pillow pets. my son has those same pirate sheets!! I believe the term is eclectic. I like it. Ha! I made one of these for my couch in my "formal" living room and go figure …. kid magnet! I guess I will have to also make the kids each one of their own before mine is ripped to shreds lol. These pillows are darling! Love the fabrics you chose. Thanks for sharing. Seriously adorable! Your son has a heck of an eye already! Even with the mommy editing, I'm impressed! Your fabric is really cute and the pillow is too! Darling bedroom decor. The little monster next to the pillow is soooo cute. He's a lucky little guy to have such a great mommy! Really cute pillows. Bet if you boys love them, my little guy would as well. I love your sproket pillows! 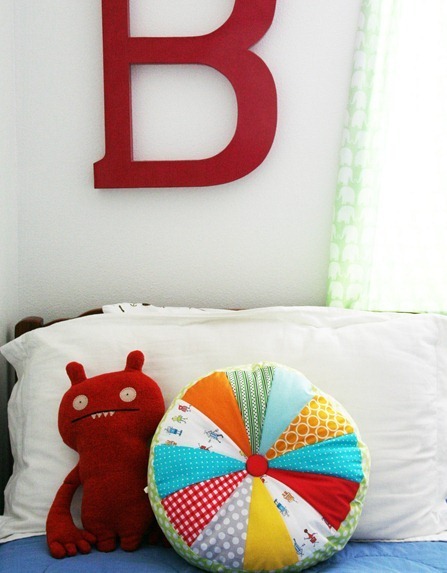 The day I saw them I knew I wanted to make one for my son's room…I love the fabrics you chose! Truly cute as can be! Love that the fabric can make them fun and funky, or totally glam. This is adorable! 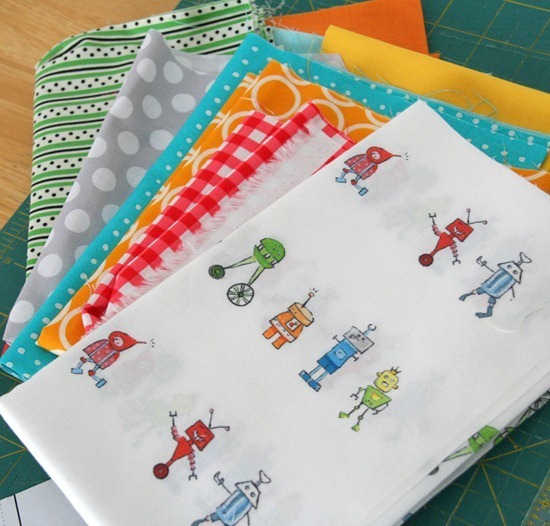 Love love love the robot fabric! I really enjoyed the story! I still have these on my "to make" list and can imagine they are going to be great! Oh and interesting about the name too! Neat! That sounds like my grandson's room. Very eclectic. But it is all the things he loves, so he's happy! 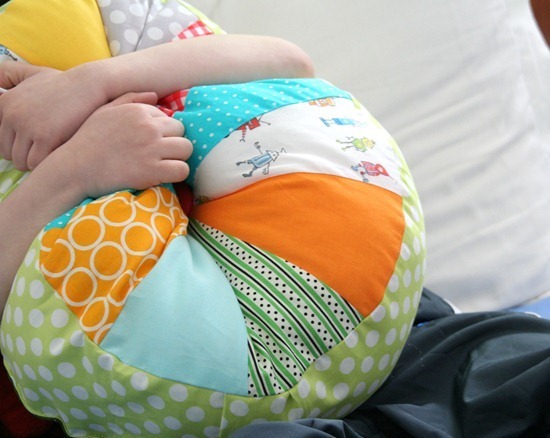 I love the sprocket pillows, they look such fun. Great choice of fabric, too. The little robots are such a nice touch. That's adorable! I totally cuddle the stuffing out of it too! !